Knowing the boys and even Alana have been long time fans of Littlest Pet Shop, I quickly agreed to review the newest in the DVD series. On September 1st, 2015, Shout Factory Kids, in collaboration with Hasbro Studios, released Littlest Pet Shop: Halloween Fest on DVD! This collection will include 5 episodes featuring Blythe Baxter (Ashleigh Ball). Also included is a bonus sing-along. My boys were huge fans of every Littlest Pet Shop episode they've come across, so I knew there was going to be a good chance they would enjoy this one! Not to mention the spooky theme for my Halloween loving family! 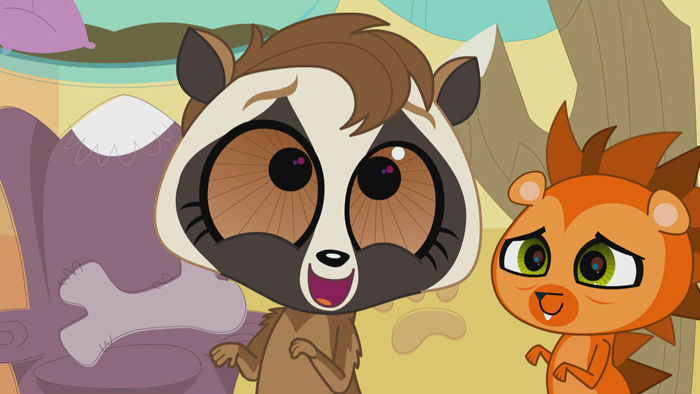 The synopsis says "Blythe and her best friends from Mrs. Twombly’s Littlest Pet Shop are back for more off-the-wall pet adventures! Join Zoe the spaniel, Pepper the skunk, Sunil the mongoose, Russell the hedgehog, Penny the panda and Minka the monkey as they plan a visit to Blythe’s fashion camp, prevent the sabotage of an important photo shoot and catch a design thief! All of this and more give us a reason to Paws for Applause!" We are such a huge Halloween family that I knew we would especially love this one! Dane loved watching the first episode Russel and Blythe had a sleepover haunted by a ghost. He like how it was scary at first but then they quickly realized they needed to investigate before jumping to conclusions. They were especially excited that this DVD set came with their own pumpkin carving stencils too! Recommendation: Both boys enjoyed watching this and I thought the lessons especially about dealing with scary moments were fantastic! I definitely think it's worth it to purchase any of these DVD's if you've got little ones. There were tons of colors and good lessons all which kept Declan's interest viewing it more than once. 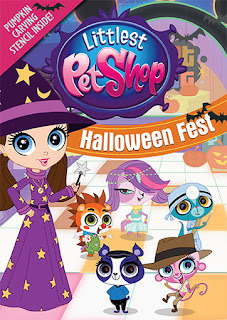 Giveaway: Shout Factory is going to give one of A Lucky Ladybug's lucky readers a copy of Littlest Pet Shop: Halloween Fest on DVD to have of their own! My daughter went a s a Pop Star. She liked being a princess last year. My favorite was a vampire costume. My twins went as a dragon and a princess! Loved it! Last year my boys went as Captain America and Iron Man which was really cute. Right now her favorite costume is a dragon and his is a minion. I am sure that will change in the coming weeks though. My daughter dressed up as tinkerbell and my son as peter pan. Was so cute! I daughter dressed up as Alice in Wonderland and that was my favorite. I have not dressed my youngest one, this year will be her first year of Halloween. I like the puppy costume. my daughter was a sunflower in a homemade costume,it was oi cute and she loved it. My daughter wants to be Marshall from Paw Patrol. We thought she would change her mind (she's been saying this for 3 months!) but so far, she still wants to be Marshall! My little ones favorite was being a dragon. She was SuperGirl a few years ago, LOVED it! My daughter liked being a dog and that is what my granddaughter is going to be this year. I love Superwoman costume, because I love to feel powerful. My granddaughter had a Lalaloopsy costume two year ago that I thought was adorable. Last year our whole family went as different Wizard of Oz characters. Not only did everyone look great but we had so much fun going around trick or treating as a family. Favorite costume was r2d2- raising them right! My daughter so far has loved dressing as Elsa from Frozen. My sons favorite was his Captain America costume, he still plays in it.